GLOGIRLY: Have You Seen the Chicken? WAFFLES: Hey Boss, have you seen the chicken? 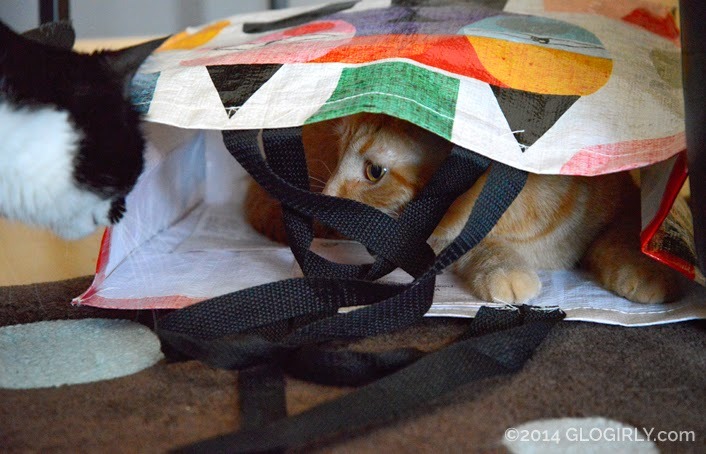 KATIE: Waffles, what are you doing in Glogirly's shopping bag? WAFFLES: I'm waiting for the chicken. KATIE: Waiting for the CHICKEN??? Right here on the living room floor? Pretty sure chickens are against the Townhome Association rules. WAFFLES: No Boss, the grocery store chicken. Last time I saw him he was in THIS bag. KATIE: Uh, Waffles... I don't know how to tell you this, but that chicken is gone. WAFFLES: Gone??? Like on vacation? KATIE: Uh, yeah. A long, long vacation. KATIE: Not exactly. Remember dinner last night? Please never leave your cats unattended with a bag that has handles on it. If it's a paper or plastic bag, just cut the handles off. Kitty can get their head caught in the handle very quickly and if no one is around to help... well, we'd hate for anyone to get hurt. 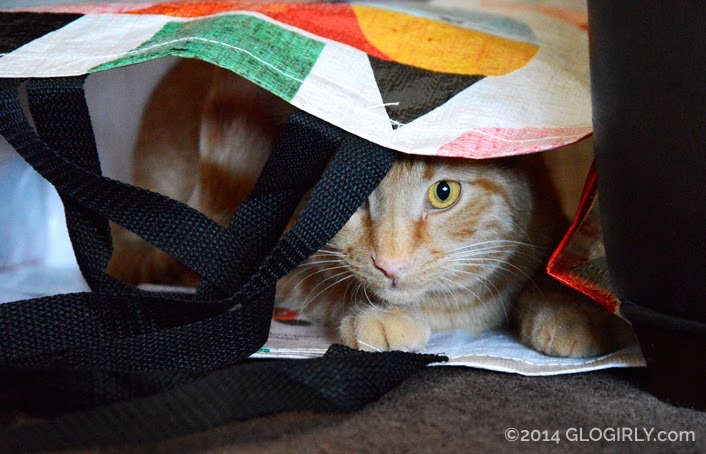 Katie and Waffles are only allowed to play and hide Glogirly's grocery tote when she's about two feet away, camera in hand. Otherewise, the bags are stored out of reach. Waffles, aren't you glad you are a kitty and not a chicken? Didn't you get to eat him? Or did you? and here we honestly thought someone was referring to waff as *the chicken* and in his Ornj brain he was looking for a real bird! now we're all hungryfied too. Did you get any Waff? Don't worry, Waffles - you'll see the chicken again... or at least a reasonable facsimile! Better get out of that shoppin bag before you end up like that chick-hen, Waffles! MOL! Have a great Friday, furriends. Hope you got some of that chicken! We hope you & Katie got to eat some home cooked chickie. It's good stuff!!! Run, Waffles, Run! That bag didn't work out so well for the chicken. Just sayin ... better to be safe than sorry! Chicken?? just hang on Waffles. Another one will be along soon. Yes! The bags are the best places to be in!!!! Wanted to welcome you to the Tabby Cat Club. Your invitation to post as an author has been sent and your TCC badge is on the way via email. We are having a St. Patrick's Day party, hosted by Raz, at the club on Monday so hope you can make it. So sorry it took the mom here sooooooo long to get things done for me. You didn’t get your piece of the action, er, chick-hen at dinner? That’s sad. Was it rotissirie chick-hen? Those are the best. Another one will appear soon... like magic! If only you could remember waffles what you had for dinner last nite. Is your memory going already? Mmmmmm! We love chicken. 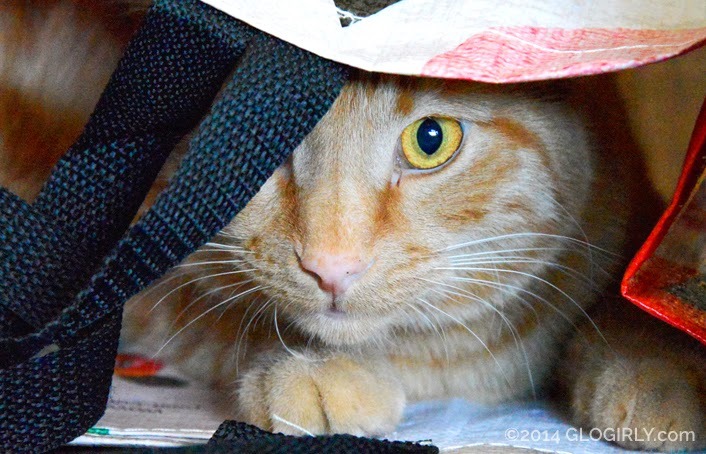 If you be very quiet, maybe another one will get in the bag! Bark More, Growl Less Barking from the Bayou! We love chick-hen Waffles. We are glad when it leaves the bag and gets into our tummies! Concats on joining The Tabby Cat Club, nice to have another Gorgeous Ginger there. OMG Waffles - you ATE the chicken!! You'd better hork him up quick. Hey Yeah..Chicken & Waffles..did you have gravy with that lol..
Did you get some of the chicken Waffles? Tee!! Hee!!! That is so furry funny!!! Oh no Waffles did you eat that chicken? Was it good? Chicken for dinner? That sounds yummy! That sounds like a good dinner to us, Waffles. Come visit us, and you can see some turkeys... that's close to a chicken. Allie: They're so...so... well, not innocent.